Rebecca Bitrus, a Nigerian victim of Boko Haram, attends a ceremony in Rome where the Colosseum was lit up in red to draw attention to the persecution of Christians around the world on Feb. 24, 2018. Almost a week after Boko Haram extremists kidnapped more than 100 girls, the young women remain missing, leaving parents in the northern Nigerian town distraught and angry. Many fear that the girls abducted from Government Girls Science and Tech College in Dapchi, Yobe state, Nigeria, on Monday, will become child brides for the Boko Haram militants, who descended on the school raining bullets, sending many of the students into hiding. 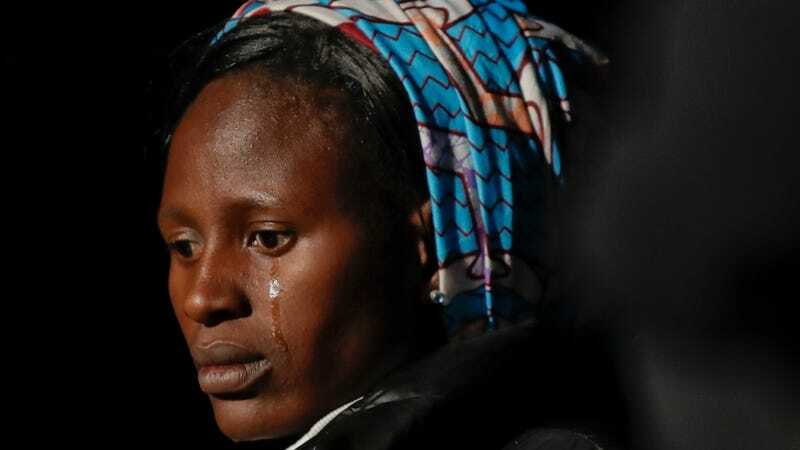 According to the Associated Press, Ibrahim Gaidam, the governor of Yobe state, initially set the number of girls who were missing at 84, but family members quickly rejected the tally and issued a list of missing daughters, totaling 105. Former (but still my) President Barack Obama sent troops to Chad after the militant Islamic group kidnapped 200 Nigerian girls in 2014. Although Obama was criticized for his delay in sending help, Chad became a U.S. ally in the fight against Boko Haram, and its military is considered one of the most capable and stable in the region. The country had dedicated more than 2,000 troops to the war against the extremists. In 2015, Boko Haram controlled territory in West Africa the size of Belgium, but Nigerian and Chadian forces gained almost all of it back. Boko Haram had been almost totally defeated in the region. The country’s military also played a huge role in cooling tensions in Mali and was most prominently fighting terrorists in Niger. And then Donald Trump issued his travel ban. Although geopolitical experts couldn’t figure out why the executive order included Chad, the Trump administration pointed out that there were a number of terrorist groups in the area, which is exactly why you don’t piss off the people most capable of fighting them! Others speculated that Trump’s decision might have something to do with Chad being a majority-Muslim country. And a black country. Chad, in response, began pulling troops back from the war against Boko Haram, a move predicted by almost every foreign policy expert. Trump’s reported comments calling Nigeria a “shithole country” not only infuriated many of the countries on the African continent but also served as an obstacle to Nigerian-U.S. relations, which had grown increasingly warm under Obama. Trump’s insults and “America first” policies likely signaled to Boko Haram that the U.S. intervention that took place under Obama was probably not going to happen during the Trump administration. Well ... we’ll let you know when he says something.